With Parliamentary polls nearing, politicians turned the drought into an opportunity for wooing voters by running water tankers. Water scarcity was debated at street-corner campaign meetings, and rival political parties blamed each other and even the monsoon for the crisis. The India Meteorological Department considers south west monsoon to be deficient if rainfall is below 20 per cent of the average annual rainfall. Since 1980 Kerala has suffered seven years of deficient rainfall and another five years of below normal rainfall, but it's surprising that even then no one saw this year's drought coming. An analysis of the south west monsoon since 1998 shows that except Thiruvananthapuram in 2001 all districts have been receiving highly deficient rainfall in most years (see table: Falling rains). The state government estimates that it has lost Rs 2,844 crore due to this year's drought. The same amount as the Central government's budget allocation for Jammu and Kashmir in 2003-2004. The drought has made 42-year-old farmer John Peter a pauper. When he started farming six years ago in Vadakarapathi village in Palakkad district, he had Rs 4 lakh in his bank account. Today he owes Rs 2 lakh in debts. "All because I decided to take up farming as my occupation. With shrivelled coconut, tapioca and tindora plantations all around, my 10-acre land looks like a graveyard," he says. Last year Peter harvested 30 tonnes of tindora: this year he has got just five quintals. He drilled the bore well in his farm to a further 650 feet (over 200 m) this year but even then he gets just an hour's water to irrigate crops. And the bore well doesn't give drinking water - for that Peter and his family are at the mercy of tankers. Peter is lucky -- he got at least something from his land. Thousands of farmers didn't bother to care for their crops because there was little water in the canals. Palakkad district takes pride in being Kerala's largest rice producer, but this time in its Chittoor taluk farmers harvested paddy much before the first grain sprouted so that they could at least save the hay for their cattle. "They did not have much choice," says Sudevan, a member of Karshaka Sangham, a CPM-affiliated farmers' organisation. Palakkad with its large rain-shadow area should be getting bountiful water, but in its villages like Vadakarapathi, Ezhuthrampari and Kozhinjampara this was the fourth successive drought. Palakkad's trouble became worse when Tamil Nadu released less water from the Parambikulam-Aliyar Project in 2003. According to a long-standing agreement, Tamil Nadu, which gets water from the Chalakudi river basin in Kerala, is supposed to divert 7.5 thousand million cubic feet (TMC FT) of this water to Palakkad every year. But it only released 4.1 TMC FT till February which was too little for the thousands of farmers owning 20,000 hectares of paddy field. The entire crop was destroyed. "This canal system is important to us because it brings water to the remotest places. It irrigates paddy fields and also rejuvenates ponds and wells," says 62-year-old Kesavan, a farmer in Chandanapuram village in Chittoor. In the high ranges of Idukki district, which produces 75 per cent of India's cardamom, farmers fear one-third of their crop will fail. "Cardamom needs 2,400 to 2,800 mm of annual rainfall. Otherwise the plants will stop yielding though they may not dry up," says P Basak, former executive director of Kozhikode-based Centre for Water Resources Development and Management (CWRDM). But this year the drought was so severe that in Nedumkandam, which grows the maximum cardamom in Idukki, the plants dried up. A sample survey done by B A Prakash, head of economics department, University of Kerala, Thiruvananthapuram, in 30 agricultural clusters across the state found that the drought had destroyed principal crops. Based on inputs from 900 medium and marginal farmers, the survey found that on an average a farmer lost Rs 17,524 because of damaged crops. About 81 per cent of the rabi paddy in the surveyed areas was fully or partially damaged, and production is estimated to fall by 46 per cent. Plantain and tapioca plantations too will suffer heavy losses, says the survey. Compared to seasonal crops, perennial crops like areca nut, pepper, coconut, cardamom and rubber suffered more damage during the drought. Unable to accept the severe loss caused by the failure of pepper and coffee crops and the burden of loans, 11 farmers have committed suicide in Wayanad district since April 2004. The rate of suicides among the state's farmers has risen to 32 persons per lakh in 2002 from 13 per lakh two decades ago. Kerala has the highest rate of suicide in the country, but farmers killing themselves is all together a new trend in the state. Kerala was boiling in anger because of the drought. Chief Minister A K Antony was made aware of this rudely when he toured drought-affected areas in March 2004. Thousands of residents of Rosappookandam, a resettlement colony near Thekkady Periyar Sanctuary in Idukki district, waylaid him for hours and told him that they get drinking water supply only once a week. Antony promised that the problem would be solved soon, but "it is more than a month since he visited us and our grievance remains the same," says Shajahan, a tourist guide at the Periyar Wildlife Sanctuary. The 4,000-odd residents of Rosappookandam came here when the Idukki dam was constructed in 1974. And for these 4,000 residents, there is just one public tap. "We haven't got even one bucket-full of water since the tap was installed three years ago," says Shajahan. Right under the village, a pipe carries water to Tamil Nadu from the Thekkady reservoir. Shajahan feels the pipe is cruel joke on the village. "Look at the irony. Through a vent in the pipe, we can see water flowing 300 m below. We listen to the flowing water all the time but we do not have a drop to drink," he says. If Rosappookandam has a water pipe but not water, Kuttanad in Alapuzha district has 1,100 square kilometres of wetlands but its 1.8 million people don't have clean drinking water (see: 'Waterhunt', Down To Earth, September 30, 2002). The Pampa, Achankovil, Manimala and Meenachil rivers empty freshwater into the wetlands, but ponds in most Kuttanad villages are so dirty that they can't be used even for washing. Since March 2004, the Kerala Water Authority (KWA) has been supplying treated drinking water to Kuttanad. It needs an estimated 18 MLD (million litres per day) of drinking water. But " KWA supplies eight to 10 MLD from its main treatment plant in Thiruvalla," says Thomas Cherian, executive engineer at Kuttanad Water Supply Scheme. 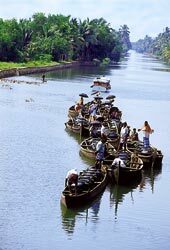 Hundreds of country boats fill municipal water of the Thiruvalla pumping station in plastic tanks and haul them to villages located in the backwaters. "Year after year people in Kuttanad have been facing drinking water shortage," says Father Thomas Peelianickal, executive director of Kuttanad Vikasana Samithy, a non-governmental organization (NGO). Kuttanad, once called the rice bowl of Kerala, was lucky to harvest paddy this time but the yield was low because its water is becoming more saline. As if running out of water isn't bad enough, a power crisis looms over the state. As many as 15 hydroelectric projects in the state, including the one at Idukki, produced 7,305 million units (MU) of electricity in 1998-99, the figure fell to 4,819 MU in 2002-03 and this year an all time low of 4,314 MU is expected from hydroelectric projects. This drop in power generation is blamed on poor rainfall. Considering that Kerala gets almost 60 per cent of its power from Tamil Nadu and other states, under-performing hydroelectric projects mean severe economic loss. In Wayanad's forest reserves the drought brought a tragedy. With almost all water bodies in the sanctuaries drying up, forest department officials saved animals by digging artificial ponds and filling them with water transported by tankers. But not before five elephants and several bison died of thirst. Deers, which strayed into human habitats for water, were chased and killed by dogs. Why didn't John Peter get enough water for his crops? 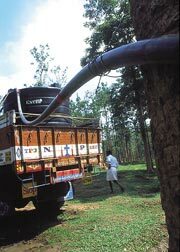 Why do Kerala's people have to drink stale water supplied by trucks? Why did farmers in Chittoor harvest their paddy before time? Why does a state with 3,000 mm of rain each year -- almost three times more than the national average -- suffer droughts? It's true that Kerala has an extremely high population density (about 800 people per square km), but the water available through rainfall per capita per day is approximately a massive 11,500 litres. Why then can't several parts of the state get even 50-60 litres of water for domestic use per person daily? "Inefficient water and land management practices are the principal causes for this crisis," says Srikumar Chattopadhyay, a scientist at the Thiruvananthapuram-based Centre for Earth Science Studies (CESS). "Soil in Kerala can retain water only for a maximum of three months. Unless, it is replenished periodically through precipitation many parts of the state will face acute water shortage," says A Achyuthan, a hydrologist and a former professor at National Institute of Technology in Kozhikode. But for decades marshy lands and wetlands, which recharge groundwater and help in retaining soil moisture, have been reclaimed for constructing houses and setting up coconut and other plantations. Forests play a key role in holding soil together and retaining rainwater, but large-scale deforestation has been occurring in the state since the seventies. Forests help in orographic or convectional rainfall (rain in hills during evening). Kerala had an estimated forest cover of 44.4 per cent in 1900. Independent studies and satellite images show the forest cover came down to 14.7 per cent in 1983 and is 9 per cent now. But the state government, which regards plantations as forests, says the cover is 27 per cent. Kerala has a high vertical slope and its average breadth is 50 km; because of this 41 of its 44 rivers originating in the Western Ghats empty into the Arabian Sea in less than 48 hours after a rain. Atmospheric scientist P R Pisharody has calculated that the momentum of raindrops falling over Kerala is about six to seven times higher than that in Britain. Kerala has an estimated 77.35 billion cubic metres (BCM) of fresh water, but nearly 40 per cent of the water resources are lost as run off. This loss means only 42 BCM of water is available though the state needs 49.70 BCM for irrigation, domestic use, industries and other purposes annually. This shortage leads to people exploiting groundwater so severely that the water table in several districts has fallen to 200-250 m. Ponds and lakes too recharge wells, provide water for domestic use, irrigate crops and ensure groundwater isn't over-exploited. But there is no policy for preserving small water bodies. All places in Kerala, except a few in Palakkad, got more rainfall this summer than the national average. “Considering that India receives only 1,100 mm of rainfall as long period average, isn’t it absurd to say that Kerala suffered acute water scarcity even after getting 2,270 mm of rain in 2003,” says Achyuthan. Unlike other states in India, Kerala is blessed with regular rainfall: 60-65 per cent from the four-month-long south west monsoon, which begins in June, and 25-30 per cent from the north east monsoon during October-November. Rest of the rain comes during summer. But since 1982 the amount of rainfall received has fluctuated wildly; since 1999 there hasn’t been a single year when the annual rainfall touched the average value of 3,107 mm. On an average, annual rainfall has dropped by 15-20 per cent. The south west monsoon has been particularly poor — in 2002 and 2003 it was deficient by 33.3 per cent and 26.4 per cent. In 2002, the rainfall during the north east monsoon and summer helped in getting over the poor south west monsoon. But in 2003 even the north east monsoon failed, and in January-March 2004 no place in the state got rains. Data collected over the last 50 years shows that the amount of rainfall during the south west monsoon roughly follows a 30-year long and 11-year short cycle in Kerala. Data gathered in Kozhikode shows that annual rainfall in the district has decreased since 1900. Going by the two cycles, people hoped that the trend would reverse soon but there is bad news for them because the number of rainy days in Kerala is falling drastically. In Tholpetty forest range of North Wayanad, the average annual rainfall in 1961-1970 and 1991-2000 was 1558.91 mm and 1653.04 mm. But the number of rainy days came down from 111 days in 1961-1970 to 95.6 in 1991-2000. At Kozhinjampara, in Chittoor taluk of Palakkad district, there have been a minimum of 47 rainy days and a maximum of 104 rainy days between between 1976-77 and 2001-02. The mean for the whole period was 71 days. All these figures indicate that monsoon in Kerala has become unpredictable. “That Kerala is a water-surplus state is a well-perpetuated myth,” says Basak, who prepared the state’s first water policy in 1992. “If you look at the per day per capita availability of water, Kerala ranks lower than Rajasthan and may be at par with the national average,” he says. Jeopardised by indiscriminate sand mining in all rivers of the state (see also: Mining ban: Slipping like sand). The entire sand in seven rivers falling into the Arabian Sea in the Greater Kochi Region will be mined out in less than a decade, warns a study by CESS. These rivers have an estimated 56 million cubic metres of sand, but about 6.63 million cubic metre of it is being extracted every year at 981 locations. This mining is shocking because only 0.086 million cubic metre of sand is replenished each year. Apart from retaining water, sand regulates the water flow in the rivers, particularly in lean months. CESS estimates the mining will reduce river channels by four to five metres within a decade. The Central Water Commission has already found that riverbeds are declining alarmingly in several places. “In many places sand has been completely extracted till the clay bottom of the river,” says N K Sukumaran Nair, general secretary of Pampa Parirakshana Samithy, a non-governmental organisation (NGO) fighting to save the Pampa river. In April 2004, the state government stopped issuing permits for mining in rivers. While sand mining dries up rivers, the Central Ground Water Board (CGWB) and Ground Water Department of Kerala have found that groundwater too is being over exploited. They say Kerala has 6.84 BCM of replenishable groundwater. Of this, 6.229 BCM was considered to be usable but in 1999 itself 2.693 BCM was already being used annually. The two organisations also found that groundwater was either over-exploited, critical or semi-critical in 15 blocks of the state. In 33 other blocks, 70 per cent of the groundwater is being used. 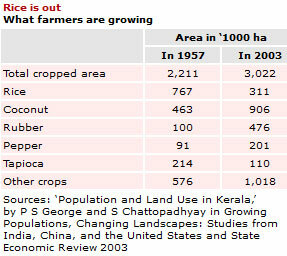 When Kerala was formed in 1956, the total cropped area was over 2 million hectares. 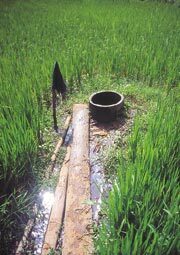 Paddy was the dominant crop, accounting for about 35 per cent of this area, followed by coconut at 21 per cent. Paddy fields converted to non-agricultural use are mainly used for constructing buildings and laying roads and railways, says ‘Population and Land Use in Kerala,’ a chapter written by P S George and S Chattopadhyay in Growing Populations, Changing Landscapes: Studies from India, China, and the United States, published by National Academies Press. Buildings and roads of course don’t recharge water. Kerala’s farmers are replacing uneconomical and labour-intensive paddy with perennial crops like coconut and areca nut, but all major and minor irrigation projects in the state have been built for large-scale rice cultivation. Huge investments were made on these irrigation projects, but little thought was given to improving water supply to semi-urban and rural areas. Most of these irrigation projects (16 completed and another 15 in the pipeline) were copies of those done in Bihar, Madhya Pradesh and Uttar Pradesh. “The projects in these states are suitable for semi-arid regions, but Kerala is a humid tropical region,” says Basak. By the time most dams and irrigation canals were constructed, the areas to be irrigated weren’t being used for paddy. Even the State Planning Board admits the mistake. Till 2002-03, Kerala had spent Rs 3,245 crore on irrigation. About Rs 2,220 crore (68 per cent) of this was on major and medium irrigation projects. But “such a huge investment has not succeeded in generating commensurate increase in area irrigated,” says the planning board’s 2003 Economic Review. When Kerala began planning its irrigation projects, planners and engineers wanted to convert the maximum agricultural land possible into paddy fields. These engineers and planners, who estimated that only 50 per cent of the rainfall could be used for cultivation, estimated that several irrigation projects were needed to get more water. Their planning and projects has now led to “irrigation in excess of the actual demand”. “An attempt is being made to consume more water than the state really requires for irrigation. The gross inefficiency of Kerala’s irrigation projects and its persistence have retarded the development of other efficient water management strategies,” says V Santhakumar, of the Thiruvananthapuram-based Centre for Development Studies. A major chunk of the money for Kerala’s irrigation projects comes from the Central government, whose irrigation policies are shaped by the requirement of semi-arid regions. When the Centre distributes funds for irrigation projects, planners try to get the maximum money even if their states don’t need such projects. Irrigation projects, necessary or not, are then built but drinking water or storage schemes don’t get attention. Crores over decades have been spent on irrigation projects, but when it comes to treated drinking water, only 59 per cent of the rural population and 79 per cent of urban population get it. In several rural areas one tap caters to 250 people; this means treated piped water reaches only 10 to 15 per cent of the population. At least 80 per cent of the people depend on the state’s 4.5 million wells and 5 per cent on ponds. But as the groundwater is falling, it means more and more people would demand treated piped water. “As long as people were using wells, water was available for a longer period of time. But not now because water is being lifted out mechanically,” says E J James, executive director of CWDRM. KWA estimates it would need 6,675 MLD of drinking water in 2010 and 8,772 MLD in 2020 if supply is be given to the entire population. There are 31 irrigation projects, but only two reservoirs for storing drinking water. KWA has 1,655 schemes but it only supplies 1,700-1,800 MLD of drinking water all over the state. Faced by growing demand, the state has signed several expensive agreements with international organisations for water supply projects. KWA will implement a Japan Bank for International Cooperation project in Thiruvananthapuram and Kozhikode and three rural areas. The entire cost will be Rs 1,787.45 crore; the work in Thiruvananthapuram alone will cost Rs 215.12 crore. “Has anyone assessed the need for such a project?” asks a CESS scientist. A project has been planned for Kozhikode too, but Achyuthan claims water shortage in the city could end if public wells and ponds are maintained properly. “Instead of this, they want to spend Rs 430 crore to bring water from the Peruvannamozhi river basin 35 km away,” he says. The 450-crore Jalanidhi project, which is being implemented by the Kerala Rural Water Supply and Sanitation Agency, is also creating controversy. The World Bank has lent Rs 300 crore for Jalanidhi, which began in 2001 and will cover three million homes. Each micro-level watershed project under Jalanidhi is expected to cost between Rs 5 lakh to Rs 8 lakh. This means a capital expenditure of Rs 2,250 on each beneficiary family. Jalanidhi water will be available to people at a rate of Rs 6 per kilolitre, three times that charged by KWA. The argument is that KWA currently spends Rs 8 on supplying one kilolitre of water. “The project will slowly take the government out of water supply though it is the state’s duty to provide water at a rate affordable to people,” Achyuthan. While such expensive projects are being taken up, the example of Olavanna has been forgotten. This village, seven km away from Kozhikode, has been running its own independent drinking water project since 1987. 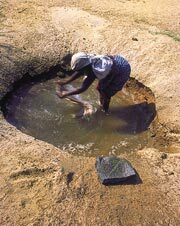 Using ponds and wells, the village supplies 400 litres of water daily to each household. “These community projects have more relevance today because they are up against the market values propagated by the agencies of globalisation,” say Babu Parassery, ex-president of Olavanna panchayat and T P Kunhikannan of the NGO Kerala Sastra Sahitya Parishad. "Renewables are the second largest contributor to global electricity production. They accounted for 19 per cent of production in 2000, after coal (39 per cent) but ahead of nuclear (17 per cent), natural gas (17 per cent) and oil (8 per cent). Most of the electricity generated from renewables, however, comes from hydro power plants (92 per cent) followed by combustible renewables and waste (5 per cent).Geothermal, solar and wind accounted for less than 3 per cent in 2000," says the report. Due to high share of biomass in total renewables, non-OECD regions like Asia, Latin America and Africa are the main renewable users. OECD countries used 70 per cent of new renewables like wind and solar in 2000. Renewable energy can't become the world's powerhouse unless governments stop subsidising fossil fuels and promote policies that encourage investments in renewables. Governments across the world have been experimenting with various schemes to encourage renewables (see box: The world: set to surge?). Germany's feed-in-tariff system increased the share of renewables in the country's total energy supply and decreased the cost of wind energy turbines. UK wasn't very successful when it first experimented with tenders, but it expects a lot from the new promotion system of renewable obligation. The experience of these two countries shows the intricacies of promoting renewable sources. Between March 30 and April 4, 2004, the German government took two completely opposite decisions regarding the energy sector. Following a European Union directive (2003/87/EC) on emissions trading, the German government on March 30 announced its 'national allocation programme' to reduce carbon dioxide emission. As part of this directive, member states had to submit national allocation plans detailing the carbon dioxide emissions targets they would achieve by 2007 and 2012. Germany's ministers fought hard: the economics minister wanted low reduction targets, and the environment minister higher ones. Neither was willing to budge, and agreement was reached only after Chancellor Gerhard Schroeder intervened. Experts say this agreement is "not very ambitious": economics has won over environment. According to Germany's allocation plan, it will reduce emissions from the current 505 million tonnes of co2 to 503 million tonnes by 2007 and 499 million tonnes by 2012. "This is a very bad plan. At times, the influence of coal lobby is amazing," says Danyel Reiche of the Environment Policy Research Unit, Free University of Berlin. The allocation plan seems to be industry's victory over environment. But it is not. The plan is a compromise between industry and environment. This was proven when on April 2, 2004 the German parliament approved an amendment to the Renewable Energy Sources Act of 2000 (Erneuebare-Energien-Gesetz or EEG Act) guaranteeing a higher and fixed feed-in-tariff for many renewable energy resources. It is seen as the next big step in encouragement. "This is a typical German compromise. Within the same week they passed a plan to promote coal (national allocation plan) and also made a very nice law for the renewable sector," says Reiche. According to the German Federal Ministry for Environment, Nature Conservation and Nuclear Safety, the feed-in-tariff system has greatly encouraged renewable energy. By 2002-end, the sector comprised 9 per cent of the electricity produced in Germany; by October 2003, about 50 per cent of the world's installed wind energy capacity was in Germany. It leads the world in the sale of bio-diesel (with a share of 2.5 per cent in the German fuel market) and has the second largest installed solar photovoltaic capacity in the world. All this in just 14 years. law, loans and politics: Germany started encouraging renewable energy in 1974, but it was in 1991 that it gave the sector the greatest push.In this year, the Act on Supplying Electricity from Renewables (Stromeinspeisegesetz, Str EG) came into force. This act "obliged public energy utilities to purchase and pay for electricity from solar and wind energy, hydropower, biomass, sewage and landfill gas on a yearly fixed basis," write Mischa Bechberger and Reiche of the Free University of Berlin in Renewable energy policy in Germany: pioneering and exemplary regulations, in the March 2004 issue of Energy for Sustainable Development . After Str EG was enforced, installed wind capacity in Germany grew almost a hundred times within a decade: from 48 megawatt (MW) in 1990 to 4,443 MW in 1999. The cost of producing electricity from wind technology today almost equals the actual cost paid for electricity. While on an average a fixed tariff of 7.5 cents/kWh (US $9 c/kWh) is paid to power from wind, the average industrial electricity price is about 6 cents/kWh (US $7.2 c/kWh). Renewable sources found their greatest supporter when the Green Party formed a coalition government along with the Socialist Democratic Party in 1998. One of its major achievements was an agreement, signed in June 2001, to phase out nuclear energy, which produces 30 per cent of Germany's electricity, by 2021. Greens say renewable sources can fill the gap, but industry associations representing conventional energy say their fuels and imported gas can meet the shortfall. 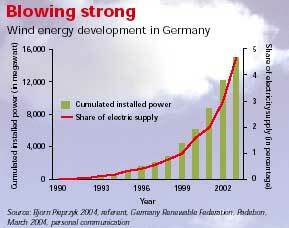 Renewable sources in 2002 formed 2.9 per cent of the total primary energy consumption in Germany. In the renewables share, 49.2 per cent came from biomass, 22.5 per cent from hydro, 16.1 per cent from wind and just about 1.9 per cent from solar (PV plus thermal). For the electricity sector alone, renewables accounted for 7.6 per cent of the total electricity consumption in 2002, which was about 582 terawatt hour (1 TWh = 1,000 gigawatt hour = 1 billion kilowatt hour). Wind power contributed 2.7 per cent (about 15.8 TWh) of the total electricity consumption in the country while solar energy only 0.03 per cent (0.1 TWH). Coal contributed 51 per cent in the electricity sector and nuclear power 31 per cent. eeg, a class act: The Renewable Energy Sources Act of 2000 (EEG) aimed to at least double the share of renewables in electricity generation by 2010 from the baseline year of 1997. This means that at least 12.5 per cent of electricity would come from renewable sources by 2012. Unlike the earlier feed-in system, EEG guaranteed a fixed, declining or regressive feed-in-tariff for all the electricity produced. The tariffs are guaranteed for 20 years and they reduce with each year. The tariff for biomass reduces by 1 per cent each year, for wind 1.5 per cent and for PV, 5 per cent. This would mean that a PV plant set up in 2004 would get a 5 per cent lesser tariff than the one set up in 2003. According to EEG, a grid operator cannot say no to renewable energy producers and has to give renewables priority over other sources. The latest amendment to EEG encourages developing biomass-based renewable technologies (see box: Farm to fleets: running on biogas in Germany). It gives a higher feed-in-tariff to biomass plants of lower installed capacity. The tariff keeps reducing as the plant size goes up. For example a plant less than or equal to 75 kilowatt installed capacity gets a feed-in-tariff of 12.5 cents/ kWh (US $15 c/kWh); while one of 5-20 megawatt gets 8.4 cents/kWh (US $10.1 c/kWh). Impressive? Not to all Germans. Many say wind energy is erratic. "At a given time, feed-in from the entire wind capacity installed can be up to 2,139 MW less than the prognosis. This creates a huge problem because the gird operator will have to keep a reserve of 2,130 MW for balancing power. This is highly costly," says Till Bohmer, head of the renewable energies section, German Electricity Association, VDEW, an electricity industry body. "For the installed capacity of 14,500 MW of wind farms," adds Bohmer, "We need 13,000 MW installed capacity of conventional power as reserve to make up for the times when wind energy is not adequate." But others disagree. "Industry exaggerates the amount of balancing power required," says Heiko Stubner, staff member at the office of German parliamentarian Hermann Scheer. The government pays no subsidy for the feed-in-tariff system; the extra cost is paid by the consumers. Certain energy intensive industries are exempted from paying the higher tariff under EEG. "As the electricity bill does not contain a break-up of the details -- electricity rate, distribution charges and money paid under EEG -- it is not very clear how much extra an average household pays for renewables. On an average it could be about 1 (US $1.2 /kWh) per month for a household," says Uwe Busgen of the Federal Environment ministry. "The electricity bill of an average household has increased by about 13 (US $15.6 /kWh) per annum because of higher tariffs paid under the EEG," informs Lutz Mez, deputy director at the Environment Policy Research Unit, Free University of Berlin. The electricity industry argues EEG is pushing prices too high. "Today the cost of supporting renewables comes to 0.46 cent/kWh (US $0.55 c /kWh), a total of 2 billion Euros (US $2.4 billion) per year. This is too much for the industry to pay. Households are already paying 40 per cent of their electricity bills as taxes. Can they afford the future increase?" asks Bohmer. The resentment is also due to fears that renewables will lead to job losses in the conventional energy sector. This despite data from the Federal Environment ministry that renewable energy has created 1,35,000 jobs in the country and recorded a turnover of 9.6 billion (US $11.5 billion) in 2002. The UK, too, has tried out renewable energy slow but steady. No all-in-14 years reforms and no Green Party to help out. According to the British Wind Energy Association, the UK possesses 40 per cent of the European Union's total wind resource. This alone, theoretically speaking, should be enough to meet the country's current electricity need eight times over. But by 2003 UK had only 600-plus MW of installed wind energy. In 2002, 1.2 per cent of the primary energy and one per cent of the electricity in UK came from renenwables. "The promotion framework for renewables in UK did not meet with much success," says David Elliott, professor at the Energy and Environment Research Unit, The Open University, Milton Keynes, UK. "The country has taken a very soft approach," says Elliott. But things are looking up. "Reliance on abundant domestic energy resources has kept renewable energy in the background," writes Timothy P Brennand of the School of Environmental Sciences, University of East Anglia, UK, in the paper Renewable Energy in the United Kingdom: policies and prospects (March 2004 issue of Energy for Sustainable Development). "Now the prospect of exhausting indigenous fossil fuel is combining with heightening environmental awareness. Now is the time the UK can benefit from the application of technologies such as wind-farming," writes Brennand. the first step: UK began supporting renewables in 1990 with the Non Fossil Fuel Obligation (NFFO). The government ordered 12 regional electricity companies (RECs) to supply a certain amount of electricity from non-fossil fuel sources for a specified period. Developers were invited to bid for projects, and bidding drove project prices very low. The successful bidders had to then supply the electricity from renewables. The cost incurred by the electricity companies on supplying electricity from renewables was compensated by the Fossil Fuel Levy, paid by all licensed electricity suppliers. The suppliers' cost was in turn borne by their customers. Interestingly, the main aim behind introducing NFFO was to support nuclear power plants of total 8.5 gigawatt capacity. "Nuclear power costs 10 per cent more than the other energy sources. This extra cost was passed on to consumers under the NFFO mechanism. Originally it was supposed to be called the nuclear surcharge but they named it NFFO and included renewables in it. But the fact remains that 98 per cent of the money went to nuclear energy and rest to renewables," says Elliott. NFFO failed to get 1,500 MW of energy from renewables by 2000. "The NFFO tendering system was good at giving contracts, but not at bringing actual finances into the renewables sector," says Marcus Rand, chief executive, British Wind Energy Association. The upside was that overall prices for renewables kept falling in different NFFO rounds: starting at about 5.5 pence/kWh (US $9.3 c/kWh) in the first round down to 2.7 pence/kWh (US $4.6 c/kWh) by the fifth round. Wind energy prices fell, from 6 pence/kWh (US $10.2 c/kWh) in 1991 to 2.5 about 2.5 pence/kWh (US $4.2 c/kWh) in 1998. NFFO also opened up the sector for investments. NFFO has now been abandoned in favour of the renewable obligation.renewable energy, by obligation: In April 2002, UK introduced the renewable obligation (RO) scheme, which obliges a power supplier to derive an increasing percentage of electricity from renewables. Nationally, it was 3 per cent in 2003 and 4.3 per cent in 2004, to be increased up to 10.4 per cent by 2010 and 15.4 in 2015. To prove their compliance, suppliers will have to provide RO certificates to UK's energy regulator OFGEM (Office of Gas and Electricity Markets). RO certificates are like currency; one certificate equivalent to one MW of electricity supplied through renewable sources. Electricity suppliers can meet their obligation by either setting up their own generating capacity, or buying it from already existing plants, a step which will get them certificates equivalent to the amount of energy bought. They could also buy certificates from renewable energy generators. "Currently these certificates, called renewable obligation certificates, are traded at 35-45/ MW (US $59.5-76.5/MW)," says Michael Cupit, assistant director, Energy, Chemicals and Utilities, Ernst and Young, London. "The actual cost of electricity from conventional sources like coal is about 18/MW (US $30.6/MW)," says Cupit. Suppliers can also trade certificates between them. If suppliers fail to meet the target or fail to supply certificates, they have to pay a fine of 30 (US $51/MW) to OFGEM for each MW shortfall. Money from this fine is collected into a separate buyout fund. "At the end of the obligation period of one year, the money is distributed amongst the suppliers depending on how many certificates they redeem," says Gaynor Hartnell, director of policy, Renewable Power Association. For example, if a supplier has provided 100 per cent of its quota of certificates and these certificates are 25 per cent the total collected, then that supplier will get 25 per cent of the money from the buyout fund. "This creates a feedback mechanism to encourage more renewable generation, which gets stronger the further we fall behind the target. The theoretical value of a certificate to a supplier comprises 30/MW (US $51/MW) buyout plus the returns expected from buyout recycling," says Gaynor. RO has benefited the wind energy sector the most as it is seen as the most cost-effective technology. "This year we will be doubling our installed wind capacity," says Rand. Already 1,148 MW of onshore and 1,109 MW of offshore wind projects have been approved. The British Wind Energy Association expects 750 MW/year increase in installed wind capacity till 2010. UK's electricity industry is growing at a rate of one per cent, or about one Gigawatt per annum. But what about other renewable technologies like solar energy? "Little money is being spent on solar energy because costs are high," says Catherine Murray of the department of trade and industry. "We are obsessed with cheap energy. The government says that let us wait for the price of renewables technologies to come down. Most companies have stopped research and development on renewables," says Elliott. In 2002, renewables contributed one per cent to the total primary energy consumption in UK. Out of this one per cent, maximum contribution was from biomass (83.2 per cent from landfill gas, sewage gas, domestic wood, industrial wood, biofuels and others) and 3.4 per cent from wind. "The RO system has its own problems, like slow project financing. Uptake and development have been slow and in 2002-2003 compliance was only 48 per cent. The same is likely to be repeated in 2003-2004," says Cupit. According to the data from OFGEM on compliance in 2002-2003, "out of 38 supply companies in England and Wales, 12 met their obligation wholly through the production of certificates, and nine suppliers paid 100 per cent buy-out (30 per MW; US $51/MW). In Scotland, 28 suppliers had an obligation, of which 16 met their obligation wholly through producing ROCs, with four suppliers paying 100 per cent buy-out." For 2003-2004 the buy out price will be 30.51/MW (US $51.8/MW) . Cupit says that RO may be a slower promotion system compared to feed-in-tariff but it is cheaper. "From the investment point of view feed-in-tariff may be better but RO is cheaper compared as the cost of a certificate will go down as the share of renewables and their installed capacity increase. Extra money to be paid to the generator will go down and so the cost for customer will also be lower," explains Cupit. Renewables obligation promotion system has made UK a promising market for renewable energy. Financial consultant group Ernst and Young has placed UK at number one in their latest 'Country Attractive Index' for investments in wind energy sector. "In UK, renewable energy is the only game in town. In the next five years 10-15 billion (US $17-25.5 billion) of new investment in the power sector will be in renewables and only 1.5-2 billion (US $2.5-3.4 billion) in fossil fuels," says Cupit. Much of the investment going into renewables is expected to be in offshore wind farms. "We could have a situation in 2010 where 70-80 per cent of the target of having 10.4 per cent of energy from renewables is met. This means that 7.5-8 per cent of the total electricity will actually come from renewables while the rest 2-2.5 per cent will met through buyouts or trading certificates," says Hartnell. This means additional 10,000 MW from renewables. 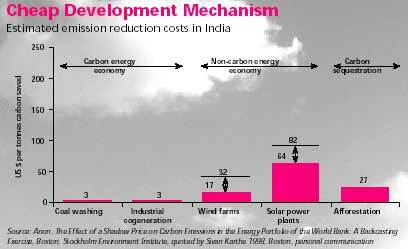 Traditionally, India has promoted renewables by subsidising capital costs, giving soft loans and tax grants and by tax depreciation. (see table: India: set to surge?). But the Electricity Act of 2003 sea-change India's electricity sector. The Act completely de-licenses electricity distribution and permits captive power generation. Any person who sets up a biomass gasification plant or a wind farm is free to sell electricity. "This is likely to boost up stand-alone renewable systems, which can then electrify more than 25,000 remote villages," says N P Singh, advisor, MNES. The Act also says that all state electricity regulatory commissions have to fix a certain minimum target (percentage of the total power) of electricity, which power distribution licensees will have to provide from renewable energy sources. "This Act gives tremendous hope to investors," says S V Kulkarni, head of marketing, Enercon India, a subsidiary of Enercon GmBH, a German-based wind turbine manufacturing company. The National Electricity Plan and the National Tariff Policy will be critical in the support they provide to renewables. "The main shortfall in our policy and support mechanism was the different tariffs and policies of state electricity boards," says Kulkarni. "The single biggest impediment for renewable energy power producers in India is the state electricity boards' poor. As of February 2001, the boards collectively owed over Rs 40,000 crore to various central public sector undertakings and the railways. Over one-sixth of the power distributed in India is pilfered. About 60 per cent of it is either free or subsidised," says Pranab Ghosh, associate director of Mumbai-based Rabo India Finance Private Limited, which finances renewable energy projects in the country. So what needs to be done? According to A M Gokhale, secretary, MNES, wind energy is only a part of the solution. It is ideal for grid-connected power generation, but of no use to villages for it is intermittent, he says. See box: "Only biomass-based technologies can ensure energy security in our villages. But it has been completely ignored," he adds. "While the Electricity Act 2003 is a huge step in the right direction, investors will now watch how these enabling regulatory mechanisms are operationalised. As opposed to the earlier emphasis on generation, there is growing realisation of the importance of investments in transmission and distribution infrastructure," says Ghosh. "We have consistently demanded a uniform fixed tariff from all electricity boards. Renewable energy projects also need longer power purchase agreements, at least 10 years, to provide investment security," says Jami Hussain, technical advisor, Indian Wind Energy Association, New Delhi. As India reforms its electricity sector for more renewable energy, the world is getting together on renewables. Literally. In June, more than 1,000 delegates will gather in Bonn, Germany, for the International Conference for Renewable Energies (Renewables 2004). This is being organised by the government of Germany, which along with the EU, is a strong votary of globally-binding targets for renewables. But developing countries may not want that. As Gokhale puts it, "We do not agree with them: They cannot dictate targets and time periods to us." At Renewables 2004, "an international action plan will be on the agenda, including actions and commitments by governments, international organisations and stakeholders," says the conference announcement document. "The conference outcome will include arrangements for a follow-up and a mechanism to share information on progress in implementing the international action plan." But the big question is: Will the conference weaken the fight against climate change? Or will it provide the Kyoto Protocol -- the legal instrument to limit greenhouse gases now bottled up by the obduracy of rich nations -- the necessary push? That renewable energy can help in fighting climate change is indisputable. But even as the US and Russia have derailed the Kyoto Protocol, the EU's insistence on national targets for renewables is seen by developing countries as a new 'conditionality' on the development process. Developing countries need the ecological and economic space for growth and for this the industrialised North must cut its emissions. The Kyoto Protocol provided the first, perhaps hesitant and weak, step. More importantly, the protocol was built on the global compact of equity and fairness in the use of global commons. The next step should have been to negotiate for equal rights and per capita entitlements to emit greenhouse gases. This would have created an incentive for developing countries to invest in renewables, made them more accessible and affordable. Under the Kyoto Protocol, it has been agreed that nations can use instruments -- such as the Clean Development Mechanism (CDM) -- to trade their emissions, However, given the sheer intransigence of the rich nations to pay for the necessary transition, CDM projects favour the cheap end of change. The same mechanism could have encouraged transfer of renewable energy technology to developing countries, so ensuring developing economies access to the best available and least polluting renewable technologies to leapfrog to a non-carbon based energy trajectory. Instead, the Kyoto Protocol's design supports short-term, cost saving and intermediate options like coal washing and gasification projects. Technologies like solar and wind, and new renewables like fuel cells, with very high emission reducing potential but comparatively high cost, are losing out. Moreover, concerned civil society organisations, helpless against their own governments and worried about this trend, have turned on the pressure on the multilateral system -- the World Bank and such-like -- to stop financing fossil fuel energy projects. They argue that these funds are used to invest in polluting energy sources and want the banks to fund only renewable-based projects in developing countries. However, besides the sheer immorality of this arm-twisting, which shifts the burden of change from the rich to the poor nations, the groups fail to explain who indeed will pay for the higher costs of this transition (see box: Does the end justify the means?). Developing countries fear Renewables 2004 will turn into a negotiating forum to set targets, which will become conditionalities for aid or trade. They argue, instead, that targets must not be imposed upon nations. India already has a declared objective to have 10 per cent of all new electricity projects till 2012 from renewable energy sources. Thailand has announced it will increase the share of renewables in its entire primary energy sector from the current 0.5 per cent to 8 per cent by 2012. Brazil has been pursuing an aggressive programme, and has shown great success in ethanol use. Last heard, China was planning to introduce the feed-in-tariff mechanism, a very aggressive approach, to promote renewables. They believe that their future lies in a mix of energy technologies. Investment in biomass-based technologies, its research, development and dissemination will be their biggest opportunity for economic and ecological security. Instead of forcing additional alternative targets, technology- and money-rich nations should realise that if the world needs to move to clean energy, they will need to do more than producing pretty words. They need to respect the environment and so reduce their emissions. Developing nations need the best in renewable technologies. This way, the entire world moves towards a renewable energy economy. Imposing targets or arm-twisting through conditional loans without defining rights and entitlements to emit carbon dioxide would only create more friction and distrust. The agenda, therefore, must rise above petty politics. It demands and deserves better.